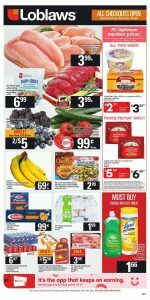 Loblaws Flyer Daily Beast 9 Apr 2019 contains special deals of this week. Do not forget to check, must-buy product list of Loblaws. You can save more than you think this time. Click on image and swipe to right, you will see amazing discounts on everything. Pick your favorite food and start to make a dinner. Healthy food deals, life style deals and daily beasts waiting for you today. Today is the last chance for these deals. Tomorrow deals will change for one week. Hurry up and pick your favorite flavor as soon as possible. Loblaws Flyer Daily Beast 9 Apr 2019 available to check here online as always. Fresh harvest’ produce just came and waiting for you. Canadian farmers picked all of them only for you. Because of this, they are all healthy and delicious. Specially grown produce on fresh rayon! Enjoy your kitchen adventure with Loblaws flyer.